Yes, it would be OK. I would make it more ponderous, though. I see, thanks! This sort of "content word pre-head" can be quite slippery for Spanish speaking learners. Hi, it's me again. Just to say that by "emphasis" I meant "prominence" (in my first comment). One basic question: such 'chopped' object-with-a-variety-of-prepositions constructions as the above with 'loss of/damage to vehicles' or 'X's position is not at all congenial to, still less conforming with, but, much rather, crassly different from, Y's' --- are they at all good English? Do they not reek of lamp-oil burnt till late in the night or worse? I used to regard them as characteristically charmingly-eccentrically English, but now Polish writers have taken to copying them, though in Polish they wreak havoc to grammar, as the prepositions usually take different cases and consequently different endings (of 'vehicles' in the example above) and I don't like them any more. If they are artificial in English, small wonder they can't be stressed 'correctly'. Nobody spontaneously speaks like that (???). Other than that, I personally find John's pattern quite natural (the one with stress on 'to'). My (layman-ish) explanation would be that tho' 'to' do not stand in logical contrast to anything _by itself_, it is a very prominent part of 'damage to', which does (viz. to 'loss of or from') and what makes it prominent is precisely its pseudo-contrast to the corresponding parts of what 'damage to' stands in ortho-contrast with, namely 'of' and 'from' in 'loss of or from'. Does this make any sense to you? In Dutch these kinds of constructions are quite ubiquitous, even in regular speech (though maybe more of a formal register), as well as in other constructions that lack a proposition. Dutch doesn't like repetition, it seems. "Does this make sense to you" - Yes, at least that's what I wrote below, more or less. Well, this reflects the Calvinist, parsimonious, ascetic spirit of the Dutch, I s'ppose... Plus, Dutch, like English, but unlike German or Polish, has no noun cases (to speak of). this is the same explanation as mine, meseemeth... . My first choice would be the one described by John too, but, again, I am not sure sure if an anglophone in his good senses would form a phrase like that in free speech (perhaps after much exposure to inscriptions like that above...). "this is the same explanation as mine, meseemeth" - yes, when I wrote it your comment was not yet visible. I alluded to that in my reply to your post. Well, this sign was the first bit of complex prose I read today, and I stared at it for a while in complete incomprehension. The punctuation was signaling to me that from was an intransitive verb in contrast with loss and damage, and never having seen such a verb, I didn't know what to do with the sentence. 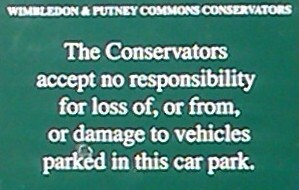 So my first order of business was to mentally move the commas to set off the major rather than the minor contrast: "The Conservators accept no responsibility for loss of or from, or damage to, vehicles parked in this car-park." parked in this parking lot. In reading this aloud, I would naturally supply the conjunction omitted before the third list entry. I should too put a comma after 'damage to' (losses of, or from, or damages to, cars parked here). However, I'd stay happy with 'of' and 'from' being, them too, divided with a comma: loss of, or from. Your example 'I walked up and down the street' is not quite relevant, because the 'up' and 'down' in 'I walked up and down the street' are virtually synonymous, or at any event inseparable, signalling different directions perchance. You won't say: 'I walked up---no, sorry, I meant, rather, down---the street. But you can say 'Last night there were no losses of, but sadly some losses from, cars parked here', can't you? See Profile for true name. Batavonophes? I've no idea who or what you are referring to by that, and "see above" doesn't help. Puzzled. P.S. If you meant Batavophones, nevermind. :) Not that I knew what that meant either, but that I could look up. Batavophones, sorry. Those whose 1st language is Dutch (Nederlands) in one of its variants. See Profile for true full name. What about using dashes? "for loss of - or from - or damage to (...)"
Different directions, yes. For me as for other Manhattanites, up means 'north' and down means 'south'. (More geographically accurate would be to say northeast and southwest, but no one does). Properly one walks up and down avenues, or east and west on streets. As a further consequence, uptown and downtown are directions more than locations: 145th St. is uptown, considered as a location, but if you are there, you may walk three blocks downtown to 142nd St. while still remaining uptown. So yes, I would say what you say I wouldn't say: "up or rather down". As for those people in the Netherlands, Belgium, and elsewhere, I just call them dutchophones myself: this is English, where we get to mix Latin, Greek, and native roots with total abandon. perhaps parentheses would do the trick equally well: 'loss of (or from), or damage to,'? I am not sure if your sense of 'up and down the street' (while I obviously am not claiming that it is incorrect) be valid for other parts of the englishophone world as well. Let alone transferable to, and applicable in, a something-other-o-phone world. Whither are you walking while walking up rather than down the street in say Paris, Rome or Cracow? The following transcription is tonetic not tonological. The accent on 'to' seems very natural: it is contrastive with the previous two prepositions. This overrules the effects of any other semantic features. I write this before looking at anyone else's comments. ˈparked | ˈin ˈthis ˎcar park. because of the analogy of ˈconser`vation — which is what they do. “The accent on 'to' seems very natural: it is contrastive with the previous two prepositions.” - That was my first impression, too! The original NED entry attributed the antepenultimate stress to French influence, while apparently not considering it current. I find no difficulty in reading the sentence aloud, and I don't see much difficulty in explaining it to EFL students. The three prepositions receive contrastive stress because there'e a contrast between [1a] and [1b] — and a further contrast between [2} and the preceding pair. Even now I've written COUNCIL instead of CONSERVATORS, but you see what i mean. There's also the matter of rhythm and pausing. • vehicles parked in this car park should be at a natural speed — i.e. slower that for loss or from but not as slow as or damage to. David, you think all that comes naturally to a native English speaker? I mean when he must read out a sign like that, and still more effortlessly when he forms a chopped sentence like that spontaneously in free speech? Reading out a sign, I think it depends on the speaker and on the circumstances of reading. Since I already knew what the sign was about, it was pretty effortless to supply the intonation etc when I came to read it in detail. And I'm not a typical native speaker in that reading aloud to bring out the meaning was part of my stock in trade as a teacher. The Conservators accept no responsibility for loss ↗OF or damage ↗TO vehicles parked in this ↘CAR PARK. The Conservators accept no responsibility for loss ↗OF, or loss ↗FROM, or damage ↗TO vehicles parked in this ↘CAR PARK. Would you use the switchback for contrast? or the take-off?